This policy complements the County Council’s Manual of Financial Practice and Procedure 1996 (hereafter referred to as the Manual) to clarify operational responsibility. This policy does not repeat requirements already set out in ratified policy or the Manual and adheres to the School Financial checklist. The lead manager for the application and monitoring of this policy is THE HEADTEACHER. 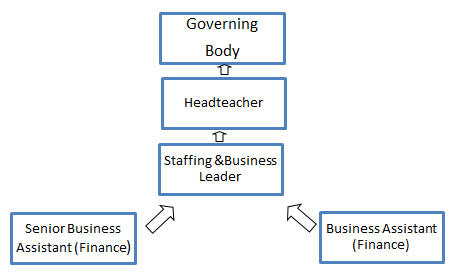 The roles of the Governing Body and Headteacher are defined by the Local Authority in accordance with the Education Reform Act 1988 and set out in the Financial Regulations section of the Manual. d) Control expenditure within the agreed budget. a) Be the designated Local Administrator of the SAP Financial System. b) Ensure adherence to the procedures and systems set out in the LA Manual of Financial Practice & Procedure. c) Authorise orders and payments for approved revenue expenditure. d) Monitor procedures and processes by termly routine and random inspections. e) Exercise day-to-day control and management of Income and Expenditure. f) Prepare reports for the Headteacher and budget holders. g) Ensure monthly reconciliation of the ‘H’ code (Trip Account). h) Approve proposed expenditure for Residential Trips. i) Authorise orders and payments for approved revenue expenditure. a) With the exception of cash purchases, all purchases shall be initiated using a yellow Internal Requisition form (Appendix II ) or by using blue Internal Requisition form if order relates to Capital Grant expenditure (Appendix III). c) Prior to raising official orders the relevant budget will be checked by the Staffing & Business Leader to ensure it is not exceeded. f) Orders will be filed by the Finance/Personnel Assistant in numerical order and held for three years. g) Items of £25 - £250 will be refunded via a cheque, excluding pay, travel, meals and accommodation. EXCEPTIONALLY small cash purchases of essential items will be reimbursed to the purchaser on presentation of a VAT receipt not exceeding £25 (cash) and £50 (cheque reimbursement) countersigned by the budget holder to whose budget the transaction is to be charged. Any receipts should not also contain personal items. h) A Purchasing Card is held by the Assistant to the Staffing & Business Leader (single transaction limit £1000 and monthly transaction limit £5000) and the Finance/Personnel Assistant, (single transaction limit £500 and monthly transaction limit £2500). Approval of all transactions is through the Staffing & Business Leader. The School agrees to comply with the policies and procedures set out in the Purchasing Card Manual. a) Prior to payment goods received will be checked against the relevant order form. In the case of small orders goods are checked and signed off by the Receptionist. For bulk orders from County Supplies (SRM - Supplier Relationship Management) the order total is committed against the School’s budget according to the coding on the order. Once delivered the SAP report will move this to actual expenditure automatically. Payment is made under dual control. IBC will reject if costs are different from order raised. purchase order is raised for each payment made and retained for seven years along with delivery notes and receipts. This is not the preferred method of payment and will be kept to a minimum. i) Each cheque requires two signatures. ii) The individual requiring the cheque may not also sign it. iii) A numbered voucher is raised against each cheque and retained for seven years. a) Cash - Counted and recorded daily. Amounts confirmed by independent dual counting by Assistant to Staffing & Business Leader and Finance/Personnel Assistant and with any discrepancies reported immediately to the Staffing & Business Leader in the first instance. Cash is held in the school safe to a maximum of £3,000 and banked once a week by Key Line. i) Weekly Budget monitoring reports will be printed and retained by the Staffing & Business Leader. Exception reports to the Headteacher to explain anomalies or unexpected variances. Overall budget reports will be signed by the Headteacher monthly. ii) Monthly checking and updating of staff costs against budget on HCSS (Financial Planning for Schools) in conjunction with Assistant to the Staffing & Business Leader. Checked and signed by the Headteacher monthly. iii) Monthly meeting between Headteacher and the Staffing & Business Leader to consider financial reports to end of previous quarter. v) Monthly reports to each budget holder (including Curriculum Areas). vi) Financial data such as HCSS is backed-up on a weekly basis. ii) Petty Cash bank account monthly - undertaken by the Assistant to Staffing & Business Leader. iii) ‘H Code’ account monthly with statements to designated budget holders – undertaken by Assistant to Staffing & Business Leader. The Headteacher will carry out spot checks termly to satisfy himself that the procedures and good practices set out in the LEA Manual of Financial Management in this document are being carried out properly and reported to the Governors. Self –evaluation of internal controls will be completed at least 3 times per year for best practice. The Governing Body have formal responsibility of the financial management of the school and this is routed through the Schools Financial Value Standard (SFVS) annual return on 31 March. Claims for Travel & expenses for either training or business mileage and associated subsistence are claimed monthly to HCC in accordance with Hampshire County Council guidelines. The latest mileage rates can be found on the County Treasurers Intranet pages. The Headteacher delegates the Staffing & Business Leader to authorise all staff travel claims with the exception of the Headteacher which must be authorised by either the Chair of Governors or Chair of the Finance Committee. VAT receipts for fuel and receipts for parking, tolls and public transport must be submitted with the claim. All claims should be submitted on an official travel claim form and input on line by the Assistant to the Staffing & Business Leader and this must be kept for seven years along with any associated receipts. to take principal day-to-day operational responsibility for, and working of, the School’s financial procedures and controls. The school follows the recommendations set out by Hampshire County Council. This would be a systematic audit dependant on the needs of the school. Management have put in place sufficient internal controls to ensure achievement of system objectives. The internal controls are working as management intended.